Did you miss Part 5? Read it HERE! Once all your leaders are on board with the vision, you will have a grassroots vision campaign happening to support your public vision casting. Now it is time to implement your God sized vision. Here are eight ways to can start doing that today. 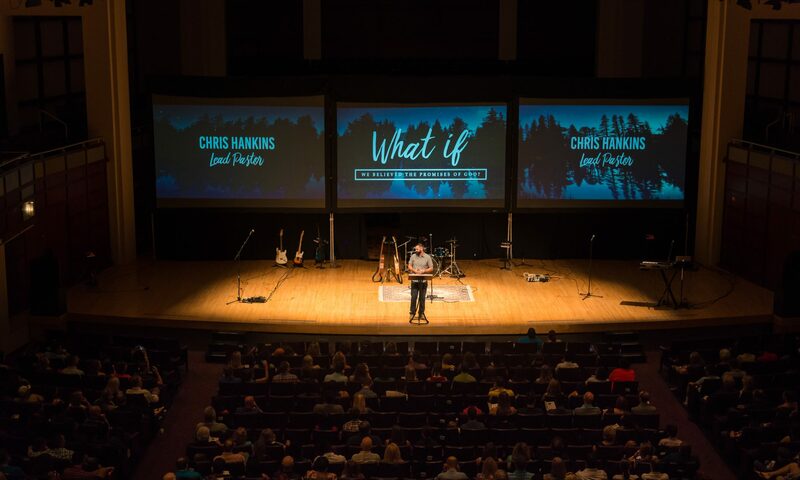 The God sized vision of your church is probably going to be something that takes anywhere from five to twenty-five years to fulfill, which means it will be with you for a while! Take the time to make it graphically appealing. Take the time to think through images that go with your vision and fonts that help to highlight your vision. If you do not have a professional graphic designer in your church, this is a time when I recommend hiring someone who can help you with this. I also recommend making a video of you sharing why you are passionate about the vision and believe it is both a God inspired and God sized vision! How and when you present your vision to your church/organization is critical because you only get one chance to make a first impression. As a result, you want to get in front of the most possible people in the best possible circumstance to share your vision publicly for the first time. At The Point Church, we utilize our yearly anniversary service to share new vision for where we are going over the next year and steps we are taking to fulfill our God sized vision. This is a time each year when people are naturally excited about our church. We share stories of how God is using the church to change lives and people are generally in a very positive mood. Also, it is one of the few times each year we bring everyone together in one place at one time. Therefore, it is a great opportunity for me to speak to the maximum number of people at one time in one place. I hope this helps to get you thinking about what the best environment would be for you to share the God sized vision for your church! Your public announcement should not be the only time your church sees your vision statement. Unfortunately that is what frequently happens. Website — Prominently display your vision on your website probably in the “About Us” section and explain with a little more detail the progress and steps you are taking to make this vision a reality. Wall – Graphically display your vision on the wall at your church facility. Whether it is a poster, wall graphic, or creatively painted, it needs to be big and bold so that every person sees it every week! You can even hang it over the toilets in the bathroom! Rotating Slides – Many churches have rotating announcement slides on the screens in the worship center and in the lobby. Include your vision among those rotating slides that people see. Membership Class – Many churches have some sort of membership class. I would make sure you display the vision and discuss it in every membership class. Your vision is the ultimate tool in developing a strategic plan for your church. Your vision represents the end of your strategic plan. Use the completion date in your vision and reverse engineer backwards until you get to the present state of your church/organization/ministry. Develop a detailed strategic plan or pathway to take you from where you are now to when your vision is a reality by the completion date. I recommend going back to this strategic plan document every six months and revising it as things continue to take shape and develop in your church/organization. Describe your strategic plan to accomplish your vision as a “living and breathing document” that is constantly evolving. This is where the rubber really meets the road when it comes to your vision. You need to actually take action on the vision. Your church should be shaped with this vision and strategic plan in mind. The most important actions you take this year and next year should be the actions you on your strategic plan that will best help your vision become a reality. You will always have limited resources, energy and manpower. Cuts will have to be made, but if you really believe in the God sized vision you have received, things that advance the vision of your church will be the last things you cut. Dave Ferguson says that a Big Vision helps all of the little things point in the right direction. What concrete actions are we taking right now to take a step in helping this vision become reality? What actions will we take in the next 6 months? What actions will we take in the next 12 months? Does our budget reflect the importance of this vision? Does our staffing reflect the importance of this vision? Does our activities and programming reflect the importance of this vision? Do not allow too much time to go by between the first time you publicly share the vision and the second time you share the vision. If you are like most churches, your people are used to leaders sharing the latest new thing they are excited about and know it is a matter of time before leaders move to the next shiny object. However, when you circle back around and recast the vision in a month or two with equally great passion, people will take notice that something is different and begin to pay attention to the vision. Andy Stanley is famous for coining the phrase “Vision Leaks.” Every month that goes by without recalling the vision, a church will leak passion and awareness for the vision. Think of vision like a helium balloon that begins to leak and deflate after a few days. It is the job of the leader to constantly pump air into the vision balloon to make sure it is flying high for everyone to see and follow. What this means is that you will have to overcome the temptation to stop talking about the vision because you believe people might be tired of hearing about it. It means that you will have to put a ton of creative energy into thinking how to keep the vision fresh. A great way to constantly retell the vision is to establish a Vision Rhythm. At The Point Church we use our yearly anniversary service as a time to retell the vision, celebrate the progress we made towards fulfilling the vision, and cast vision for the steps we are going to take this year to fulfill the vision. Halfway through the year, we have what we call the “State of The Point” where we update people on where we are as a church in relation to what we shared at our Anniversary service. Every year, the “State of The Point” includes a vision element for what we have accomplished in the first six months and a reminder of what we have planned for the second six months. One of the best ways to keep the vision fresh in your church and the excitement high is celebration. A well-known leadership principle is that what gets celebrated gets repeated. When you take time to celebrate the steps you have taken to bring your vision into reality, it accomplishes multiple important things. First, it communicates to your church/organization that God is on the move! Second, it communicates that taking steps towards accomplishing your vision is something worth celebrating. Finally, it communicates that if staff, members, or volunteers pitch in to help move the vision forward in the future, they know their efforts will likely be celebrated. Celebration paints a bullseye for people to know that action taken to achieve the vision is extremely important and should be prioritized. Be sure to subscribe to the blog to get notifications of new posts. Please feel free to comment with questions and feedback. Start reading Part 7 HERE!